It’s often difficult to enjoy a meal with children fussing about, especially if you don’t want to just keep them occupied by letting them play with your brand new smartphone or iPad, but that doesn’t mean you shouldn’t treat yourself to a day out! Here are top restaurants where you can sit back and enjoy great food while your kids occupy themselves with more than just colouring sheets (that are bound to bore them in no time, anyway). 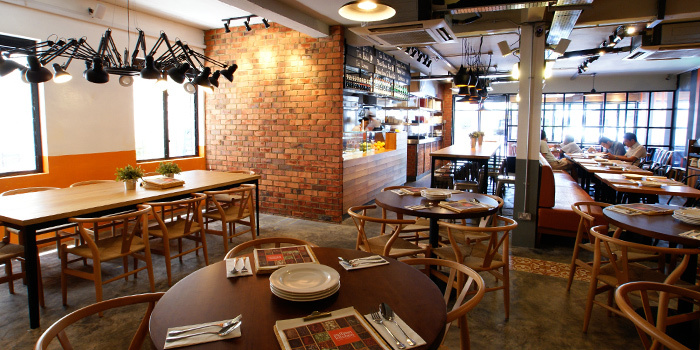 Quentin’s is a restaurant tucked away at the Eurasian Community House in Ceylon Road that serves none other than (you guessed it) authentic Eurasian food! Each generous portion serves 2-3 people, so make it a family affair. There’s a kids menu that comes with freshly squeezed apple juice and a scoop of ice cream, and even better: a playroom complete with ball pits, electronic cars, a slide, a bookshelf filled with books, and even a breastfeeding corner! Head down this Mother’s Day for an all-you-can-eat buffet for just $40 nett per adult & $20 nett per child, complete with a cupcake decorating class – an activity that both mummy and child will enjoy for sure. Imagine this: you’re enjoying a forkful of Florentine steak in one hand and a glass of wine in the other while your children keep themselves occupied with a bouncy castle, a trampoline, a bunch of toys, and a water slide (put up only on the weekends), leaving you to savour every bit of your Italian meal. La Barca Ristorante and Wine Bar goes above and beyond when it comes to providing a family-friendly environment that’ll leave both you and your children coming back for more (don’t say I didn’t warn you)! This airy restaurant at the Botanic Gardens features a spacious dining area and an outdoor playground, perfect for family get-togethers and restless kids! Food for Thought has a great kids menu that children are bound to get excited about (milk chocolate pancakes, anyone? ), and a special 4-course Mother’s Day menu for just $45. You can even take a leisurely stroll around the picturesque Botanic Gardens after your hearty meal – talk about the perfect Mother’s Day! The Bank Bar + Bistro isn’t just a swanky restaurant in the CBD where people hang out after office hours, it also transforms into a family-friendly establishment (with amazing BBQ Baby Back Pork Ribs) on the weekends. Head over on a Saturday and your kids will enjoy a children’s play area that’s complete with a ball pit, a couple of TVs, building blocks, and a plethora of children’s toys. The kids menu (that doubles up as a colouring sheet) is also well thought out, and includes goodies like Crispy Battered Seabass and Chicken Ham Neapolitan instead of the standard fare of spaghetti and chicken nuggets. A winner for sure! It’s often difficult to bring kids out to an Indian restaurant since most of them are unable to take the heat, but if you’re having serious Indian food cravings and you’d like to spend the day with them, Zaffron Kitchen is the place to be! Head to their East Coast branch for a specially curated menu for children (sans spice, obviously! ), an impressive play area complete with a wooden hut, a TV playing children’s movies, and a variety of different toys that’ll keep them occupied for a good half an hour, at least – leaving you to enjoy your Tandoori Malai Chicken Tikka in tranquility. Chill out at The Coastal Settlement’s al-fresco dining area amidst lush greenery and retro furnishings with the whole family. It’s a world away from the hustle and bustle of Singapore’s buzzing city life and the perfect place to sit back and relax with a cup of coffee and some deep fried chicken wings. There’s a outdoors playground filled with old-fashioned rides for your kids to have a go on, and feel free to bring your fur children along to join in on the fun – this unique restaurant is pet friendly! Click here for more info on The Coastal Settlement. Fancy some Korean BBQ? Now you can stuff your face with deliciously tender pieces of meat and Kimchi Stew while your kids play in a ball pit, tucked away in a glass room that makes keeping an eye on them easy. There isn’t a special kids menu available in this restaurant, but they do get to eat at a discounted price! Try the Yangnyum (marinated beef-rib) and Samgetang (Korean Ginseng Chicken Soup), just trust us on this one. Click here for more info on Ju Shin Jung. Sucker for authentic Thai food? Tuck into a delicious plate of Pad Thai or a satisfyingly spicy bowl of Tom Yum Soup while your kids run around in E-Sarn Thai Cuisine’s indoor playground! It’s located at the Grandstand, so there’s a lot you can do afterwards – like treat your kids to some artisan macarons from one of the enticing food and dessert stands at PasarBella, or take them to one of the many recreational places set up just for children like Fidgets World. It’ll be an outing they won’t forget! District 10 serves up all your favourite comfort foods in one place – mindblowingly tender Black Angus Beef Steaks, perfectly cooked Black Ink Tagliolini, Crispy Goose Leg Confit… You name it! Drop by their UE Square outlet on Sundays, where a bouncy castle is set up for your children to go wild – but make sure they aren’t too stuffed from all the delicious food before climbing in! It’s also right next to Fort Canning Park, so you can drop by afterwards for the post-meal stroll – the best way to digest a hearty meal and for your kids to run off excess energy, no doubt. We have more good news coming your way: from now till the 14th of May 2017, Mums dine FREE at these selected restaurants when you make a reservation via Chope!